The most important function for a manager is X = -Y, where X is employee brain use and Y is degree of management. To use the horse whisperer's advice, The more you use your reins, the less they'll use their brains." If you asked 100 managers which they'd prefer--employees who think, or mindless zombies who respond only (and exactly) as ordered, you'd get 100 responses of, "What a ridiculous question. We hire smart people and stay out of their way so they can do their jobs." And if you asked 100 managers to define their management style, none would claim to be micromanagers. Probe deeper, though, and the truth begins to emerge. Ask managers if their direct reports can make decisions as well as the manager can, and they hesitate. Ask if the manager could step in at a moment's notice and perform the employee's job, and too many managers would say--with pride--"yes." Take the time it takes [now] so it takes less time [later]." 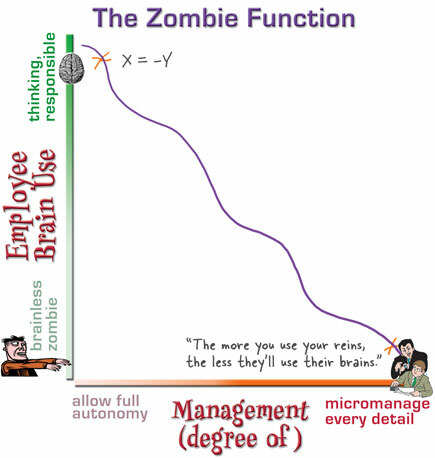 Of course micromanagers don't actually create zombies--they simply inspire (or force) zombieism on the job. Follow those work zombies home, and their zombiness vanishes. Thier eyes light up, their brain kicks in, and their passion for playing with their kids, championing a cause, or just playing their favorite after-work hobby emerges. You see the side of them that micromanagement crushes. Do you have a micromanager? Or are you a micromanager? If you demonstrate any of these seemingly admirable qualities, there's a big clue that you might be making zombies. 1) Do you pride yourself on being "on top of" the projects or your direct reports? Do you have a solid grasp of the details of every project? 2) Do you believe that you could perform most of the tasks of your direct reports, and potentially do a better job? 3) Do you pride yourself on frequent communication with your employees? Does that communication include asking them for detailed status reports and updates? 3) Do you believe that being a manager means that you have more knowledge and skills than your employees, and thus are better equipped to make decisions? 4) Do you believe that you care about things (quality, deadlines, etc.) more than your employees? "Be careful of every order you give. Once you give an order on a particular topic, you are responsible for always giving orders on that topic." What can you do if you have--or are--a micromanager? Admit it, and deal with the two driving forces: concern for quality, and need for speed. Take the time it takes today. Invest in the time and training to give your employees whatever they need to make the decisions or complete the tasks you find yourself needing (or wanting) to do. And if caring is the big concern, well, you get what you create. If you treat employees like zombies, then zombies is exactly what you'll get. Sometimes all it takes is giving people a chance to develop more skill and knowledge, the space to use their brains, and a worthwhile challenge. "But, but, but--they don't care as much as I do -- that's why I'm the manager and they're not." Bulls***. You might be the manager simply because you wanted to be a manager. Nothing wrong with that, but it doesn't necessarily mean you're better at the job than those you manage. It might even mean you're simply better at the details and support work than the actual work. Doing everything right doesn't guarantee passionate users, but if we--or those we manage--don't have passion, how can we expect to inspire our users? Re: "Micromanagers often believe that they know more, and more importantly -- care more. Often they're right." I would say that "Often they're wrong", especially about the caring more. Removing autonomy is a very effective way of destroying motivation though. Brain numbing effect is even more scarier. These guys (http://www.total-performance-scorecard.nl/)apparently talk about performance in organizations in great details. Check out the "What Managers Should Unlearn" article. Kathy ... it's all well and good to say these things. Lots of people say them, and there's a whole industry -- rather loosely called "executive coaching" these days -- devoted to this. Still, I'm reminded of the scientific catch phrase of "a beautiful theory murdered by a gang of brutal facts". Brutal fact number one: Most of us work in an organizational structure best described by the phrase "accountability hierarchy". Those two words are important -- people are *accountable* for their actions and business results, and the structure is *hierarchical*. Your boss is accountable to his or her boss for what you and your teammates say and do. Brutal fact number two: The financial success of a business depends more on the *customers'* perceived quality of its products and services relative to the competition than it does on the way people inside the organization treat each other. These brutal facts don't excuse or even explain outright abuse, of course. They don't excuse or even explain micromanagement. They don't in any way imply that change is impossible or that wanting change is futile. And they certainly don't make narcissistic behavior acceptable. They simply mean that if one wishes to change an individual manager-employee interaction, one needs to work within those constraints. A "micromanaged" employee needs to understand that his or her boss is almost certainly accountable to a higher-up for business results. And an employee wishing to change something -- anything -- must demonstrate how it ultimately affects the perceptions of products and services by *external* customers, not *internal* ones. Not to micromanage you ;-), but in order to avoid "Creating confused users": Do you really mean X=-Y ? That is the same as X+Y=0. That is, no matter how much brain use or management, you'll always end up with a big zero! The graph shows (roughly) X=1-Y (in arbitrary units), which actually implies that you can compensate for the lack of brain use by micromanagement. I'm a great believer in articulating a clear purpose and deliverable, managing by exception, challenging people to figure it out, complimenting their work, and giving them full credit when others compliment me for the work my people did. I've found too many people rise to management positions only to discover some insecurity about what it is they are actually 'managing' and then constantly working to maintain the perception that they are in charge. The only real obstacle to managing the way I do is having readily available information for anyone with a stake in what is being performed. Information bottlenecks create both confusion for the team and the opportunity for insecure managers to control the flow of information, thus solidifying their management approach. A big issue in management is that while a part of our brains are involved in higher-order stuff like making cool products or providing useful services, other parts don't get that at all and are trying to establish a place in the primate troop hierarchy. There is a big element of the silverback in the modern day CEO. And many managers are silverback wannabees. So while micro-managing may not be helping the business much, I think it offers some nice short-term emotional rewards to the manager. See the manager striding about the office, collecting "status reports", and at the same time getting lots of little social deference clues. Feeling sufficiently juiced up by the little signals of dominance, he strides back to his office with a peculiar sense that all is right with the world. At the same time the workers feel both a little bit more secure (my troop is well ordered and safe) and a bit less motivated to actually do anything (I'd better just wait for my next order). I think the monkey-brain thing is also a big factor in the "glass ceiling" effects at many companies. The women execs just aren't getting and receiving the primate hierarchy signals, so they aren't really in the game. Also, their approval doesn't count for much in the monkey-brain reward scheme, so a woman doesn't have as much currency to make deals with. By contrast, the model of a manager I've always liked is that of Jean-Luc Picard from ST:TNG - he listens to his subordinates where it concerns their areas of expertise, sets them clear and realistic goals based on their claims and advice, and then steps back & lets them do what they do best. He's also quite stern & doesn't suffer fools or failure gladly, but at the same time he's understanding if failures occur for a good reason, as long as lessons are learned from that failure & it doesn't get repeated. Having been micro-managed in the past, I can confirm, even though I'm a fairly intelligent, independent sort, the fact that I simply could not succeed at any task set unless it was done exactly according to my manager's methods (even when those methods were long-winded or doomed to fail) made me by degrees abdicate all autonomous thought, responsibility or emotional investment in what I was doing. It also stressed me out beyond belief, till in the end I almost danced for joy when I was fired because I "wasn't the person they wanted for the job". The problem that we're facing today is that we're not at war! huh...what do I mean by that? Well outsourcing hasn't hit you yet but it has killed enough jobs while we were micro managing each other. Actually I call this lull before the storm. The invisible bubble is expanding and engulfing us while we're sleeping on the job. You can strut around like a goose picking up reports (BTW not all of them do that, they assume that putting things in place, like setting up a *system* that will generate reports..duh, will give them what they need)and reporting to your boss (who's apparently micro-managing you), but REAL cracks in the wall only the acute and perspicacious can notice. The problem is that such a situation is a NO win (LOSE-LOSE, for those who'll just read the *win*)situation for EVERYONE, as the ship WILL sink! So get up and start talking to everyone before it gets to you and save your jobs. In the equestrian world, micromanaging the horse is a sign of the inexperienced or even the incompetent. It points to an equestrian skill set that is unrefined. Sometimes, it demonstrates that the trainer is afraid of the 1,000 pound horse whom he perceives as a threat. The micromanaging horseman may lack confidence in his own horsemanship. What's the result? Often, the immediate responses you see in a horse who is being micromanaged by his trainer are pinned ears (a sign of being angry) and a wringing tail (more anger, frustration, angst). Micromanaging the horse is the ideal way to make him numb, to the point where he'll simply tune you out. Micromanagement in the workplace is also the result of inexperience, incompetence and a lack of finesse with employees. Often it's fear driven. A good manager harnesses all the good know-how of her employees. She doesn't have to know everything or even be as talented as her employees are in their particular domain. She's not threatened by one thousand plus pounds of talent but knows how to put it to work towards her organizational goals instead! Not only will talented micromanaged employees tune out, numb out, possibly even become zombies. They're probably also looking for another job. Sounds like Kathy's hit a nerve here. Bravo. Ed, the thing is, that your "brutal facts" don't change anything. The theory about external customer satisfaction seems irrelevant and one-sided. All employees, including management, have that responsibility and almost all employees, including management, have somebody they report to that should deal with their mistakes, either by firing or by teaching. If she's right, and I think she is, then it doesn't matter what your reasons are for micromanaging. Your result will be inefficient employees who are afraid to make a decision without your approval. I don't think she said that this is always a bad thing. I think it would work well at a McDonald's. In software, though, I have my doubts. True Chaz, and by god in IT (and I'm sure in other fields of profession too*) it really means life and death. If you employees start shutting down one by one, well you better shut down the freakin' shop! * Can only talk about maritime profesion (having spent most of my colorful time there) but there the ball game is very very different. Another good point. I would also like to point out that it's not always micromanaging that stops full autonomy. Sometimes existing system constraints, business requirements, and sub-divided microteams can stop full developer involvement. For example, at a project currently under construction at Disney (The honorable Eric Freeman presiding! ), we've found ourselves limited by system restrictions and capabilities in what we can accomplish. We're trying to remain proactive about it, but it's difficult when you can only do so much with the system you're developing on. I had a role as a pure manager that lasted several years. Not being very into telling other people what to do, I gave my direct reports a very long leash. As long as they were doing their jobs, I didn't bother them except for weekly verbal status checks. This worked fine except for one guy. I quickly learned that he would underperform or even "forget" his tasks unless he was prodded daily. I had other responsibilities and more important things to do than constantly supervise him, so the result was constant poor performance on his part. I certainly let him know what a subpar job he was doing, but without active supervision, he just couldn't perform. Interestingly, he spent the first part of his career in the Navy. Point is, everyone agrees micromanagement is bad, but the principle of giving all your direct reports maximum autonomy assumes that they are competent and motivated. It's interesting to see such a wide perspective in the comments. Since I deal directly with these managers and the resulting organizational numbness that is derived from their actions or actually inaction it is noted that all of the above to a certain point is applicable. However the one really outstanding cause of the micromanager has been left out. In today’s business world the reliance on IT and its resulting automation of report systems and selective analysis, the modern manager (oxy moron) has been de synthesized to the functionality of real management and its impending results on customer service. Instead of IT making everything cozy and nice like it has, the business IT solution industry has actually created a super dependency by management and has caused huge lapses in management capability driving much of the micromanagement and inarticulate decision process seen in today’s businesses. Reports are now more important than real management. The result employees are suffocated by false goals and performance targets, customers are ignored and business approval ratings are on the skids. Management needs to stop buying into the developer hype and realize that IT solutions, such as CRM, are far from being a cure all. They are a tool to assist business processes not replace smart management decision making. They have literally taken the employee out of the creative zone, removed them from the decision process and regulated them to mundane robotic existences. Hmm, so much for the safe and profitable world of business, it does leave you wondering. Small businesses are an exception to this for the most part. Not that the small biz owner won’t micromanage, it’s just there isn’t enough time to, and they are a lot more dependant on team or shared decision processes with their employees. Plus most small business haven’t the funds to buy into the IT mentality. "The theory about external customer satisfaction seems irrelevant and one-sided." Management fads come and go, theories abound, and people claiming to know "the" answer will make it more complicated than it really is. IMHO business is about people first, goods, services, money and time second. Another "brutal fact" is that financially successful companies are usually more fun to work for than unsuccessful ones, though. "I presume Dogbert would have something to say about this post ;)"
I love this blog too and I can tell you as someone fresh out of a startup with a micromanaging boss who was accountable to no one but his own *virtuous* view of the world that a micromanager can take down a company much faster than the hands-off sort would. Especially if you hire great people and then change their job/task on a daily basis. Thanks for your post Kathy! "Well ... there's solid statistics behind this theory." Ed, I didn't intend to dispute the theory itself. I'm not familiar with it. However, I don't think your comments have explained your case well, at least to me. For instance, you mention hierarchy and accountability. I read your statements as an attempt to justify micromanagement by saying that a manager is accountable for his workers. Similarly, a CEO is accountable for his managers. Is the CEO thus obligated to micromanage his managers? I would suggest that instead, you hire "competent and motivated" managers. I also note that you put the question in terms of what a micromanaged employee must do if they wish to change something. I think I read that situation a little differently. We're talking about what management should do to benefit management, and not what employees should do to benefit employees. I gather you don't agree with the Zombie Function but at least I think we can agree that she's speaking to management about ways to increase efficiency. Since you brought it up, though: An upset employee always has the same options that an upset manager has: Frustration. Communication. Negotiation. Termination. On that note, the number of terminated relationships in the comments suggests another potential downside. And lastly, there's many, many places where drones are fine. This is only relevant if you value your workers' brainpower. Of course there is a balance between too much supervision and not enough that depends on any number of factors, and nobody is saying otherwise. It's just one factor, and I don't think anybody has presented it as "the" answer. So I am being micro-managed by a manager that does not have as much education as I do nor the amount of experience as I do and it offends me that she thinks I have to be told every little detail. It is as if I am not given the chance to do my job. What do I do? This article is interesting in that it deals with one situation for leadership (not management). When dealing with an experienced & motivated team member then all they generally need is big picture goals and general direction and they take off running. But not every team member is going to be in that situation (and depending on the area being worked the same individual may need different styles of leadership). So someone who is brand new to a team/organization may in fact be very excited/motivated but they generally don't know what they don't know. Leading this individual requires a different style than the first example. More defined goals & direction is necessary with an expectation that eventually the individual will become both motivated & experienced enough to give them general goals & direction and let them go. I have been a participant in Situational Leadership organizations and it was a good experience. Very important post for me. Enough is enough in this buzz word, management fad,"passion" driven world of business. Let's get back to common sense. As Jerome Alexander states in his book "160 Degrees of Deviation: The Case for the Corporate Cynic" - The only thing that successful businesses have in common is that they are successful. Alexander has the right idea. He's been there (and still is). This is a great read!